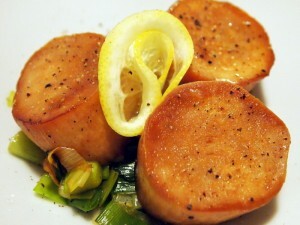 Trumpet mushrooms are used in this dish mainly because of their shape which, when sliced, look somewhat like scallops. I have no idea what scallops taste like, but if they are tender and mild then trumpet mushrooms are not a bad substitute. Mix rice wine vinegar, soy sauce, brown sugar, and water until the sugar dissolves at least four hours. To cook the mushrooms heat 1 tablespoon of olive oil in a large skillet until very hot. Carefully place the marinaded mushroom slices in the pan and season with ground pepper and a sprinkle of salt. Allow the bottom of the mushroom slices to cook until a good sear forms, about 3 minutes. Turn the mushrooms, season, and sear the other side. While the mushrooms are cooking heat the remaining oil in a large skillet over medium heat and saute the leeks until just tender, about 2 minutes. Season with salt and pepper. Plate the dish with 3 seared mushroom slices served over a 1/4 cup of sauteed leeks and a lemon wedge.